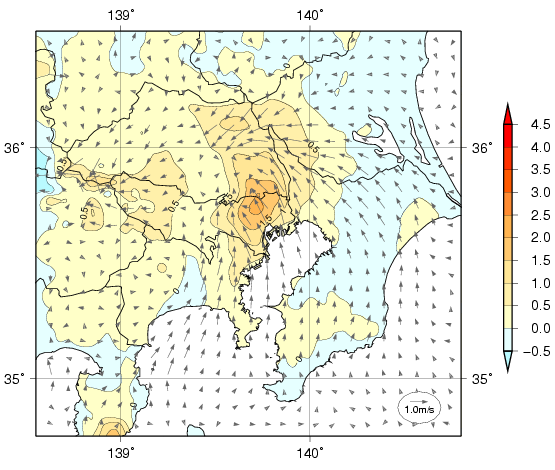 In 2005, the JMA started publishing the annual report on the analysis and simulation results about the summertime heat island phenomenon in Kanto region, Japan. On 31st March 2006, the report for the summer 2005 was issued through the JMA website. It was revealed from the model simulation that the most important factor that contributes to the formation of the heat island in the daytime is the land use change, featuring the shrinkage of green space and the growth of artificial ground cover, and the factor contributing to the formation in the nighttime is the increase of architectural structures (urban canopy). Three factors were examined by simulation experiments to estimate how much they contribute to the temperature rise. They are "artificial heat release", "land use" which includes the shrinkage of green space and the growth of artificial ground cover" and "architectural structures" which includes the decrease of the sky view factor and the increase of ground friction. Figure 1 shows the differences of "actual" minus "simulated" temperatures, which was simulated on condition that all the artificial ground cover was replace with grass land and the other factors were fixed. Figure 2 shows the differences of "actual" minus "simulated" temperatures, which was simulated on condition that all the architectural structures were removed and the other factors were fixed. From the comparison of those diagrams, it is concluded that temperature change in the daytime is larger when the "land use" changes than when the "architectural structures" changes, and vice versa in the nighttime. In the daytime, the most effective factor for the formation of the heat island is the land use change, that is, the shrinkage of green space and the growth of artificial ground cover, which cause the weakening of cooling effect through the decrease of the evapotranspiration of vegetation. In the nighttime, the most effective factor is the increase of architectural structures, which release heat stored during the daytime and intercept radiative cooling. It was found that the artificial heat release contributes to the formation of the heat island both in the daytime and in the nighttime, but its contribution is weaker than the others in those three factors. Eleven typical cases in the hot summer 2005 were selected and analysed. 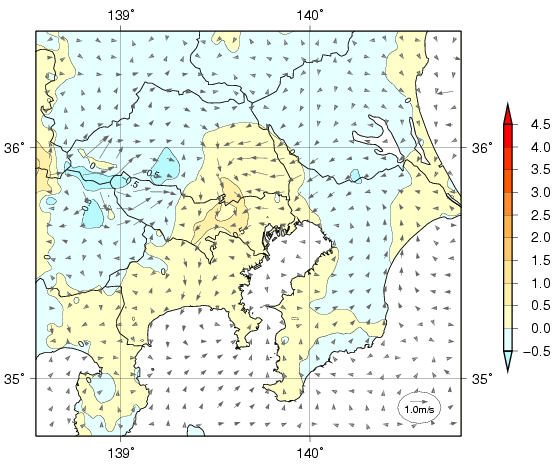 Figure 3 shows the situation of wind and temperature on 5th August, when it was sunny and weak synoptic wind. The maximum temperature rose to 36 degree C in the inland area. At 5:00 am, above 27 degree C was found over the Tokyo Metropolis and the northeastern part of Kanagawa Prefecture. At 2:00 pm, above 35 degree C covered broader area, and above 36 degree C was found in the northern part of Saitama Prefecture and the southwestern part of Gunma Prefecture. 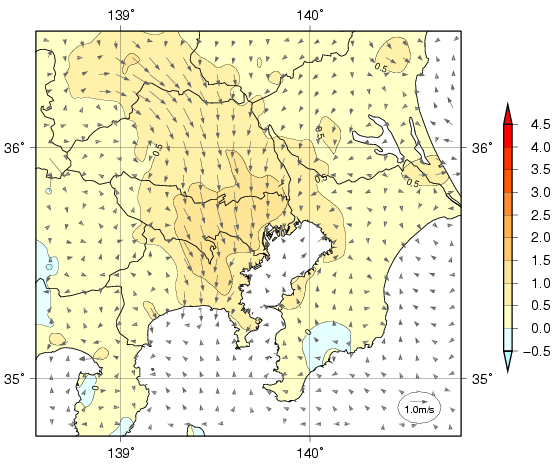 Three-dimensional structure of the heat island phenomenon was analyzed with the model simulation of the 30 cases of sunny and weak wind days in summer during 2001 through 2004. 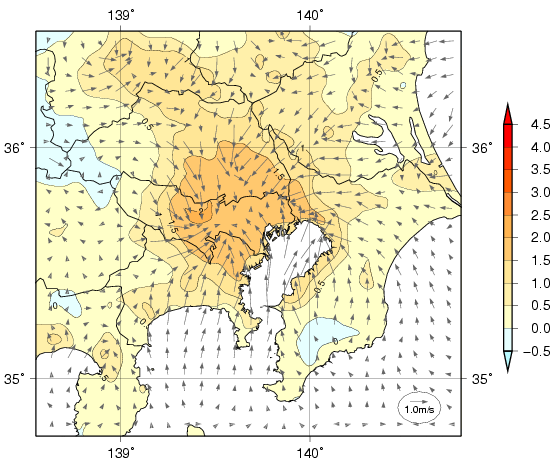 It was shown that relatively cool sea breeze flowed from the Tokyo Bay to the Tokyo Metropolis within about 1000 meter above the surface and was gradually heated up as passing over the Metropolis. This heated sea breeze flowed further into the inland area and seemed partly to caused the large distribution of high temperature. JMA is planning to analyze wintertime heat island phenomena in Kanto region and summertime heat islands in Kinki region, including Osaka and Kyoto, in the future. These analyses would provide useful information for the mitigation of heat islands through understanding the heat island and revealing its mechanisms. Difference of the surface temperature between the present case simulation and the simulation on condition that all the artificial ground cover was replace with grass land and the other factors were fixed. Difference of the surface temperature between the present case simulation and the simulation on condition that all the architectural structures were removed and and the other factors were fixed.